*Bills trade 2018 1st (#12), 2018 1st (#22) and 2018 4th (#121) to Bucs for 2018 1st (#7) and 2019 3rd round pick. -The way the 1st part of the draft shakes out, we miss out on Nelson, Chubb and Barkley. The Bills coming knocking as they’re watching the run on QB’s unfold and want to get in. We’re able to move back. I think Derwin James will go a pick or two before this spot, but we’re able to land Fitzpatrick. He gives us an interchangeable chess piece for our secondary. A guy who can cover the slot, play outside CB if needed and play the centerfield safety role. A huge land. -Having addressed the DL in FA allows us the flexibility to ‘double dip’ early into our secondary woes. We’re able to land IMO, the best CB in the draft. He just happens to excel and comes from a zone-coverage scheme. -The medical concerns long-term cause him to slip into the 2nd round. He’s arguably a top 15 talent in this draft. Undersized, but strong as an ox and creates constant pressure from the interior. He’ll give us flexibility w/ GMC going into 2019. -We’ve worked him out and had interest in him all off-season. He projects as a guard at the next level. Can slide him into LG spot from the get-go. -A bigger back who is capable of being a three down back at the next level. He’s not a burner, but has enough speed. He also features the ability to catch the ball out of the backfield, although more of a check-down option that receiving threat. -This guy takes care of two needs for us. Gives us a better option/depth with the ability to develop into a starter down the road. With DeSean’s contract up after 2018, this would put us in a good spot still having Evans, Godwin and Pettis as guys who having starting ability. He’s also one of, if not the best return men in this draft. Something we need. -Another guy we seem to be intrigued by. The combine really hurt his stock, but I’m not sure he’s ever been 100% recovered since his injury this season. He’s likely not a three down RB given his stature, but he could develop into a solid rotational guy. I like the idea of drafting 2 later round RB’s and hoping to hit on at least 1. -We’ve visited with him a couple times. A late round OT to develop. -Big space eater and gives us some more depth. He’ll challenge Stevie T for the backup NT spot. You had me with the first two picks. Definitely. We can actually go BPA. And DBs line up with that where we should be picking. I can’t lie the talent on defense would be absolutely sick. With that said I don’t think it will cost that much for them to trade up to pick 7. If it does, great, stack the talent up EXACTLY like this. The depth after our starters is bad. Defense needs an overhaul of talent in the secondary so I approve. Hurst at 38? Man, Bucs hit the jackpot there. Would be a dominant defense next year with JPP/Curry/Fitzpatrick/Hurst additions. Your Minkah tinted glasses ?? 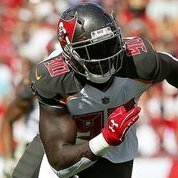 we could even take Vita Vea if we traded back! Only reason i think Hurst falling to the 2nd round is even possible is because of the condition. some teams will cross him off completely, some teams may be willing to take him, but not until rounds 2-3 as it's really unknown how long he'd be able to play long-term. I Feel like it’s more realistic for the bills to move up to 7 from 12 with their 2nd round pick. A qb of their liking needs to be at 7. If they’re going to package 12 and 22 it’ll be to move up to 4/5 range. This would be incredible. Love it!